What it’s about: Twelve-year-old Ava Bigtree and her family have been the proprietors of Swamplandia!, an alligator theme park in southern Florida, for three generations now. Her father, the Chief, has crafted an entire history for their “indigenous” clan of alligator wrestlers. For a time, business is booming on their island, as Ava’s mother, Hilola, brings crowds of tourists to see her swimming with the gators. But after Hilola’s death from cancer, the family’s star wanes and crowds leave Swamplandia! for the newly opened World of Darkness, a literal trip to Hell on the mainland. Ava’s family begins to splinter as her older brother Kiwi leaves the island to pursue his dreams of college. Her older sister, Ossie, becomes obsessed with the occult, believing that’s she’s dating a dead dredgeman. As the Chief leaves Ossie and Ava on the island to make some quick cash on the mainland, the girls find themselves in charge of a pit of alligators and their rundown park, attached to civilization only by the ferryman whose boat has been coming less and less frequently. Then Ossie elopes with her ghost boyfriend, and Ava decides to head out into the swamp with a traveling gypsy on a quest for the underworld and her sister’s safe return. Swamplandia! had a lot of good things going for it, and at first I enjoyed the absurdity of it all. All the elements of a great tragic farce were in play, from the twelve-year-old alligator wrestler to the Lake of Fire swimming pool dyed red at the World of Darkness. But be warned. Swamplandia!‘s silly title is in no way indicative of the direction of this tale. About halfway through the book I started to get nervous about the way the story was developing, as it veered away from the ridiculous and into all-too-real horror. Swamplandia! takes a very dark turn, one that the tone of the first half did not quite prepare me for. I left feeling confused about the twisting direction of this book and a bit let down that all the fun only led to pain. 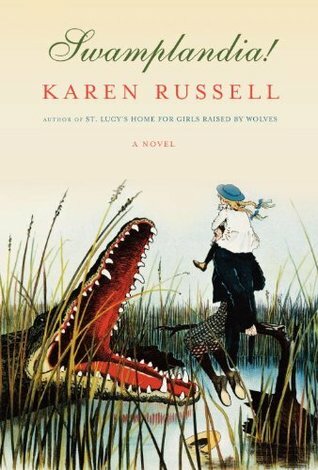 I suppose that’s how the world can be and if Russell’s goal was the convey the cruelty of the world and the horror of transition from childlike wonder and belief to harsh reality and despair, she hit it on the head. But why all the fun? Why the crazy familial history, the absurd theme parks, the tragic hilarity at the start? What was all that cleverness for if it was just a prelude to something dark and terrible? Would I recommend? I think if I had gone into Swamplandia! with different expectations I might not have felt so jarred after reading it. The book has plenty of merits: the prose is beautiful, the writing clever. The story’s ending just hurt my heart a bit. If you like your tales mysterious and dark, you may really enjoy this.